The following is a summary of the releases of Roll20 updates, along with a link to the forum post/full changelog for each. Global illumination fixed when Dynamic Lighting is disabled. Official Cypher System character sheet released. FX tool disabled when WebGL is disabled. My Audio uploads now supports .wav files. Searching the Battle Bards and Tabletop Audio libraries have user interface has improved, and now uses additional metadata to help finding the track you want better and faster. Page Settings and Page Settings Default user interface has been updated to be more clear. Polish has been added as a language option. Incompetech metadata is now available in the jukebox search and has been standardized. When the map grid size is anything other than 1, dim light now reveals as it should. Static gifs no longer convert to webm files. Image uploads outside the VTT now work 100% of the time. Animations no longer have a blurred frame. (Bug fix) Custom cantrips now correctly add an attack. Attributes no longer hidden for some D&D 5e monsters in the compendium. "Show Closed Without Status" no longer shows archived posts from other forums. Released the My Audio feature! See the forum announcement for details. Increased storage and upload caps to 3GB for Plus users, 6GB for Pro. * Increased upload limit for all users to 20 MB for audio files. Suggestions Forums: Now have filters by tag, as well as a way to view your own posts and votes. (Bug fix) The play/pause button on animated tokens no longer covers the status icons. Added a Notice in the Jukebox Fanburst tab to notify users of Fanburst's shutting down, and what Roll20 will be doing. 5e Sheet Worker Refactoring - an ongoing project to rework the sheetworkers in the 5e sheet has begun. Replaced the icons for the "Won't you be my neighbor" and "One of Us" achievements. Dungeon of the Mad Mage had a significant update. Please patch your module! Action buttons can now be enabled inside repeating sections. Several hotfixes went out last week related to Get a New Look. Get a New Look supports animations and rewrites Advanced Fog of War, Dynamic Lighting, and Fog of War. GM Layer Opacity setting in the layer selection menu. Fog of War, Advanced Fog of War, and Dynamic Lighting page settings now collapse. My Games page now paginates. Charactermancer developer documentation is now available and character sheet authors can check in charactermancer-enabled sheets. 5e D&D by Roll20 sheet: NPCs have a 2-column layout by default, but collapse or expand when the window is resized. Suggestions Forums tags have been updated and made visible. Moderator role changes, addition of Forum Champion role. Support for Xanathar's Guide to Everything in 5e D&D sheet and Charactermancer. Updated the database server operating system for stability. Site notifications bell displays notifications as links. Site Notifications: There is now a "bell" icon to notify you of sitewide updates. iOS App updated to 2.0.1 in the Apple Store. New Pick Up Game System! Updates to Dungeon World character sheet. New Tabletop audio tracks added. More information sent in eventinfo. Resizing the Jukebox window resizes the track names. Users cannot rename themselves as "[DELETED]." Handouts can now be duplicated. Quick Dice hover selector was added. Social media links updated sitewide in the footer. 5e OGL global modifiers new styling. Android App 1.8.0 released to Google Play - Fixes the charactermancer popup. Custom AC calculations and the global AC modifier section added to the official 5e OGL sheet. Charactermancer for 5e OGL Sheet has an opt-out dialog box and new styling. Updated functionality in handout and character sheet link URLs; a backtick symbol (`) at the start of the URL will send the entire URL (minus the backtick) to the chat window. In this way, you can embed rollable tables, dice rolls, etc. into handouts and character sheet text. Updated the backend functionality for a future feature. This update disables dragging and dropping compendium items that are subheads (for example: an individual class feature from a character class). Icon changed and sub-menus enabled for snap to center, snap to corner, and no snapping. When the map view is zoomed, the labels for the ruler remain the same size. The ruler now displays both the units of measurement and the number of squares or hexes being measured. You can now show and hide the ruler from other players. The GM will always see all rulers. You can now "sticky" the ruler so it remains visible after letting go of the mouse button. Alt+Double-click now opens a character sheet directly to the sheet tab. Official Pathfinder Playtest character sheet released. Official Pathfinder Sheet available for all users with release of first Pathfinder Module "War of the Crown #1"
Tasks such as adding a Module to a game, adding Addons to a game, creating copies of a game, and the patching of Addons/Modules have all been moved to the same web host that rollbacks are currently being served on. This takes them out of the main site traffic to make these processes run faster. Implementing this change alters how the Create New Game process works. Instead of jumping straight into the Virtual Tabletop after clicking on the I'm ready, Create Game! button, your browser will be directed to the new game's Details Page. The button "Join Game" has had its text changed to "Launch Game" so that the terminology is more universally understood by the game creator and the players. WebRTC now has a Mic Input Indicator to help voice-only users identify which user is speaking. SoundCloud locks down its API. SoundCloud tracks added to the jukebox are no longer playable, but are still accessible to retrieve the tracks' URL. Pro and Plus Subscribers can continue to export Characters into any game. In addition, players in your games can now export their Characters into your games even if they don't have a subscription. Non-subscribers can now export Characters into games where the game creator has a subscription. In addition, if you create a game based on a paid Module, you and your players can export Characters into that game as well. Bug Fix where a character's token is unlinked from its sheet during export. Updates to Repeating Field Fixes, Attribute Fixes, etc. Fixed 3D Dice and macro visibility issue, and more. New chat commands, API updates, and more! A Global Illumination setting to support outdoor environments where there is daylight, well-lit houses, etc. Press 'z' to zoom in on any item selected on the tabletop... Plus more! Added the new Character Vault feature. ...and a whole lot more (including hundreds of tweaks and bug fixes). Minor update which addresses some lignering issues from Rugged Reroll and has some improvements to the ordering of rendering elements on the tabletop. Tokens that "have sight" are now drawn on top of everything, preventing limited line of sight viewing angles from hiding the token. Pings and Measurements are now drawn on top of everything else as well, allowing GMs and Players to point out things on the tabletop even if they're hidden to the players. Pings, measurements, and waypoints now no longer appear to players if they are done on the GM Layer. Better proxying of external (web search) images. A new Deal to Initiative feature, very useful for games such as Savage Worlds which use card-based drawing to determine turn order. Matching new turn order sorting option to sort by card/suit. Usability improvements to the Character editor, tokens, macro quick bar, etc. Modules (collections of maps, tokens, sounds, characters, and handouts which are pre-generated and made into a Roll20 Campaign) were introduced. One free and one paid module were available at launch. 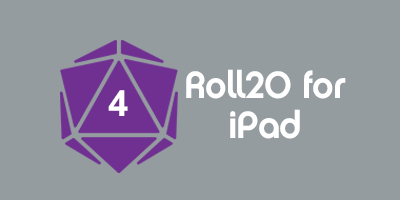 The Roll20 API was enabled on the Main Server for Pro users. Card decks were improved, with additional options for how cards are played to the tabletop, new hand management display, and a discard pile. The Roll20 Wiki was unveiled. New features for the Journal including tagging + searching journal entries, drag and drop re-reordering of attributes and abilities, players can edit Handouts, and more. For a list of updates that occurred prior to 2013, please see the following forum post. This page was last modified on 11 April 2019, at 17:12. This page has been accessed 68,391 times.